This is the first pattern I’ve had accepted to Knit Picks Independent Designer Program. It started out as a Christmas gift for my DH. I’m thrilled to see it online. It’s knit from the toe up -- making use of right and left twists to produce an Argyle effect. 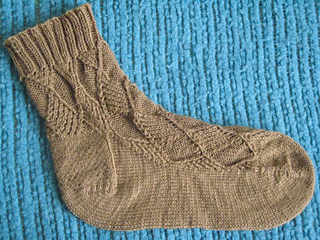 The sock pictured used only 1 skein, with very little left over. (And, it’s mate used another skein.) Three skeins will be needed for foot lengths longer than 9 1/2” or sock leg lengths more than 5”.